Special to the Daily/Carolyn PopeJean Tally, Clare Simmonds, Ruth Walker and Magda Vossler take part in the Trinity Baptist Church's annual "Tablescapes and Talk." The event was held Dec. 6 at their church in Edwards. The event, spearheaded by Melinda Carlson, gives a few hours of relaxation amid the hubbub of the holidays and a moment to reflect on the meaning of Christmas for women. Each table, elaborately decorated in a holiday theme by the table’s hostess, reflected that woman’s personality. Time, love and thought were apparent in each place setting, as the guests sat down to hearty and tasty breakfast prepared by Sharon Marner and several assistants. 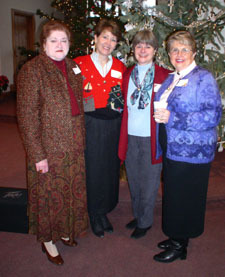 Sheri Tymkovich, Linda Hubbell and Betty Grubbs hosted tables as did Missy Jollit, Ronda Woodall and Cathy Hebert. She spoke of making it through a tough year, when “you deserve a T-Shirt just for getting through.” The necessities for making it through the days, she said, are friends, laughter, tears and prayer. She also transmitted her “seven habits of highly real women,” which included the ability to laugh easily, growing comfortable with flaws and being open with affection. The event was attended by women of all ages and faiths, enjoying each others’ company and chatting with old friends. Spotted at the event: Heather Marner, Connie Gardner, Sulin Vincent and Alex Linn.